I’m thrilled to offer this beautiful watercolor art glass necklace! This lovely necklace comes on a 17″ long red silk cord with lobster clasp. Arrives in a cute little tin. For a chance to win this necklace please leave a comment here letting me know your favorite item in the Laura Slocum Painted etsy store!! Sign up to follow my blog and receive an extra entry in the contest! My favorite item is the ‘tiny tree’ glass pendant. It’s beautiful! I like the fridge magnets too, very cute! I like the Customized Initial Pendant with the pink daisy on it. It’s so bright and summery, it would be a great summer or spring accessory. 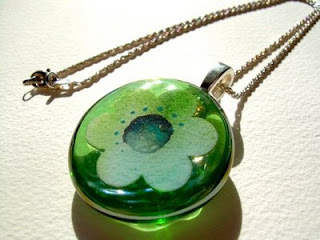 i think the tulips pendant is great, but my favorite is definitely the ‘new spring’ watercolor! all the watercolors are beautiful. Oh I love them ALL! But my favorite is the letter M as shown in your featured items. Not only is it lovely, both my first and last names start with M! I love Laura’s work- I particularly love the dragonfly piece! and of course, I follow you Cyd! The jewelry is lovely on the site you showcased. However, my favorite is flight, a dragonfly watercolor art pendant NECKLACE.